The Milwaukee County Zoo regrets to announce the unexpected death of its newest female jaguar cub, Anahish. 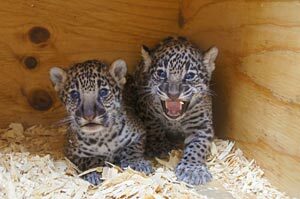 Anahish was born August 14, along with a male litter mate, Francisco. The cubs were born to 10-year-old mother, Stella, and 15-year-old father, Pat. The death occurred this morning when an interior animal shift door in the Big Cat building holding area was inadvertently left open, allowing a 2-year-old young adult male jaguar, Zean, to enter the area, which housed mother, Stella, and the cubs. Zean fatally injured the female cub. Zoo officials report Stella is showing some agitation at this time; Stella and Francisco will remain off exhibit for an undetermined amount of time. The Zoo will conduct a full investigation to determine the exact cause of the incident. A complete necropsy (animal autopsy) will be performed at the UW-Madison School of Veterinary Medicine. Preliminary results could be available within a few weeks.